Python and Django have been around for a couple of years, help to developers to make software and game. Compare to the modern programming language such as PHP and Java, Python and Django offer efficient programming structure. It’s not a modern language, it was launched in 1991, it still holds a special place in the hearts of the developers. Just what are the advantages of python and how can you benefit from using these two special languages. Python is preferred by a lot of developers of its readability, efficiency and solid emphasis. It’s better than other languages like C++, PHP, and Java, if you are interested to become a developer then python web development for beginners is a golden opportunity for the upcoming year. Latest technologies are progressing by leaps and bounds, generating a huge revolution in web app development. If you are one of those who started out with Perl, C and Java, pythons learning curve are tiny. But due to the fact that it is so easy to learn. People consider python as unnecessary programming skill which is wrong. You can easily get the python and Django web development training in Jaipur. Allows building more functions with some lines of code. If you search on google or ask a programmer which programming language is easiest to learn, so the maximum of an answer will be python. Many professional developers argue that python was designed for those who unfamiliar with programming at all. It is simple to learn and the math is acceptable as well. You can explain the fundamental to anyone who is not intimate with programming. With a few days of practice by this programming language makes developers expert. If you are writing code in Java, PHP and other. You are used to lengthy coding. Which goes from six lines to several lines. The python cuts the strength of code length. What needs six lines in Java can be simply coded in a separate line by python. This gives many different developers the ability to create complex and huge programs that can be very long without the heaviness of coding. Behalf on a developer, you will lack minimum lines to code a difficult and involved application. The biggest advantages of python that you get more with less code, you can easily build your own ideas with prototypes faster. If you want to define the most overlooked aspects of web application development. Learn the python is very easy and the learning curve acts as an advantage for those planning to code with python. It is produced in a way that you can learn it with comfort. Even if you are not aware of the basic of coding. You can efficiently code with python. This programming language has integrated with other programming languages, making development easier. It will provide you open source code so you can easily adjustable according to your requirement. The advantages of the Python programming language have an extensive library, with advantages of python supreme functionality that can be used to build large-scale applications. You can improve the skills of application with unique characteristics. To python developer have access to various programming environments and frameworks. If you want to code a large application or a complicated app. Django and flask framework better serve development requirements. Allowing quick and easy coding. You can maximize your code writing with python and because of these python web development for beginners is the best option. You can easily roll out products immediately so you can meet demanding deadlines. The different things you can do with pythons vast library of resources. It is even constantly refreshed. There is no way you will get stuck when creating a program. Despite the fact that the genetic revolution started three years ago in silicon valley the industry is still growing. Today the sector is a combination of technology and money, the biggest advantage of python is that the number of languages in frenetic beats like- Ruby, Perl, PHP, and Java. You cannot just simply put words on it. Includes search engine friendly URL generating. The search engine uses their URLs to pick up keywords and sometimes. In case your company wants to build a product your choice of language may ultimately boil down to preference and expertise. If you think about budget need a product rolled out right away, the choice of language then becomes more important advantages of python. A python is an ideal option for Bootstrappers and startups because of it’s quick deployment mention earlier with a lesser amount of requirement. I hope that this article was helpful and you learn something new. 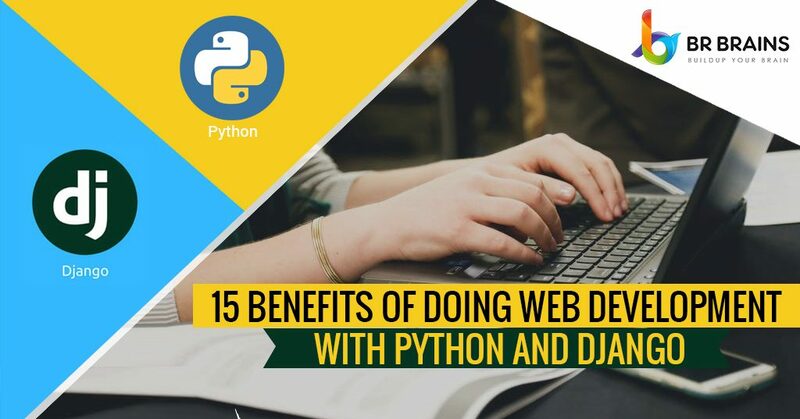 Python and Django in the ideal combination offer speed in development, the flexibility of usage, scalability and dynamic application. whether you are interested to develop a cost-effective application within in a limited time frame feel free to contact us we provide Python and Django web development training in Jaipur. At BR Brains – One of the top-notch academies for python web development for beginners, we have the highly qualified trainer and live project facility for interest candidate.